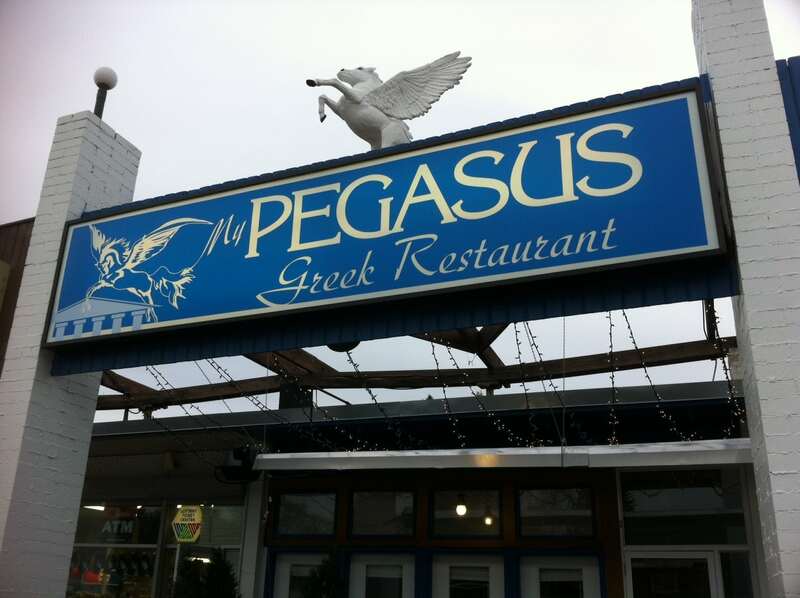 Pegasus is a Greek restaurant located in the SW Calgary community of Altadore. It is tucked away in a small strip mall on the corner of 48th Ave. and 16th St. SW, so it might take a little bit to find its location for the first time. I have to say that Pegasus is a definite must if you love authentic Greek food, or if you are looking for something different to try instead of the same old restaurant over and over again. Pegasus is decorated accordingly with tons of pictures of Greece and other ornaments and such that remind you of Europe. Before I could even check out the rest of the interior decor, we were served by a hostess who was very friendly and knowledgeable of the menu. She was definitely Greek, and quite possibly an owner of the restaurant. Pegasus uses authentic names for their menu, so describing what you want to the server is best in order to get what you want. Our first appetizer was a unique style of pita-bread I never had before which was absolutely delightful. The second was huge, delicious meat-balls and the third, leaf-wrapped ground beef and spinach with a lemon flavor. Lemon roasted potatoes were the last, and were better here than at any other Greek restaurant I have been to. Each appetizer was delicious in its own way and are served with tzatziki sauce. For the main course I ordered bass with rice and Greek salad. The fish was cooked to perfection and melted in my mouth, with a lovely lemon aftertaste. Rice and salad went well with the fish and weren’t too over proportioned in comparison. A friend of mine ordered a roasted lamb leg in a juicy tomato sauce and let me try it. The succulent meat came right off the bone with ease and was better than the fish. Not only is the food at Pegasus delicious, but is moderately priced as well. Each plate was about 16 dollars give or take a few bucks. If you want to save money when eating tasty and authentic Greek food at the same time, then head on down to Pegasus!